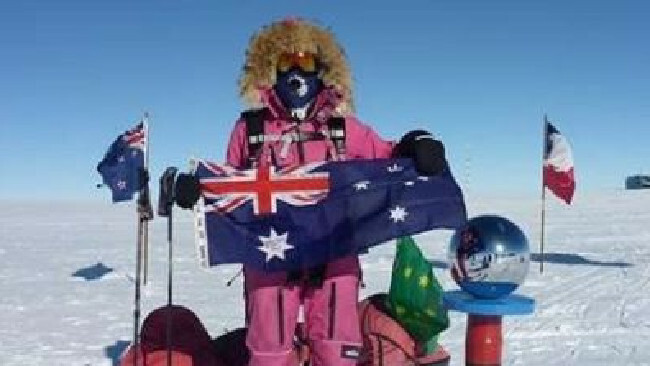 On 11th of January AEST, 16 year old Melbourne school girl and Invisalign ambassador, Jade Hameister, arrived at the South Pole after an epic 37 day journey via a new route through the Kansas Glacier, from the Amundsen Coast of Antarctica. The youngest person (male or female) to ski from the coast of Antarctica to South Pole unsupported and unassisted. The first Australian woman in history to ski coast to Pole unsupported and unassisted. The youngest to complete the Polar Hat Trick. Jade’s South Pole expedition saw her cover almost 600km across the 37 days which Jade chose to undertake without resupplies by air. This meant Jade had to travel with a sled weighing around 100kg at the start, a significant task given Jade only weighs 60kg. Jade was part of the first all-Australian team to set a new route to the South Pole, which includes her guide Eric Philips OAM, from Hobart, her father Paul Hameister (now the first Australian to complete the Seven Summits and the Polar Hat Trick) and a National Geographic camera team of two: Ming D’Arcy and Heath Jamieson, both from Sydney. Jade received surprising news half way through the expedition – she was understood to become the first woman to set a new route to the South Pole. “It’s a real honour to be able to set a new route to the Pole. I had no idea that it seems no woman had done it before until we were a couple weeks into the expedition and it came up in casual conversation with Eric during our lunch break” says Jade. Conditions throughout the journey were extremely windy and brutally cold making the days very difficult to get through. “Weather plays an enormous role in the progress and ultimate success of a South Pole expedition. This season’s weather is the worst I have seen on a polar expedition and we had unusually strong and persistent wind, whiteout, blizzards – conditions that could have thwarted the trip. The expedition was saved by our own persistence, resilience and utter determination” Eric Philips explains. The team had two days where temperatures were as low as minus 50 degrees Celsius with windchill. One of these was Christmas Day, but rather than sit it out in their tents the team chose to keep moving, gaining 13.1km that day. Jade began her Polar quest in April 2016 at only age 14 and became the youngest person to ski to the North Pole from anywhere outside the last degree and was awarded Australian Geographic Society’s Young Adventurer of the Year. In June 2017, she became the youngest woman to complete the 550km crossing of Greenland, the second largest ice cap on the planet. In her role as an Invisalign ambassador, Jade’s empowering stories and Invisalign treatment journey will be shared via video, imagery and editorial content and will be shared via Invisalign Australia and New Zealand’s Facebook pages and YouTube channel. “For us, Jade truly embodies our brand value of moving forward in life to unleash your potential. She does so with authenticity and determination. Equally, Invisalign Australia believes in Jade’s mission and ambitions, and wants to get behind her by bringing her awe inspiring and motivational stories to life in a relevant and engaging way,” comments Karen McGoldrick, Managing Director of Invisalign Australia.